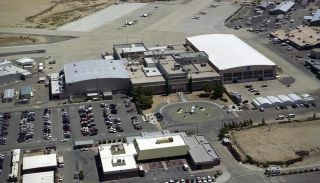 Aerial photo showing the original hangars and administrative buildings that were built in 1954 as they appeared in 2001 at what now will be known as the NASA Armstrong Flight Research Center, redesignated in honor of the late Neil A. Armstrong. With the flick of a digital switch, NASA's Dryden Flight Research Center has been renamed for the late astronaut Neil Armstrong, the first man to walk on the moon. NASA on Friday (Feb. 28) got off to an early start adopting the new name, updating its website addresses and social media handles, before the name officially goes into effect Saturday (March 1). The redesignation comes two months after President Barack Obama signed legislation enacting the change and 20 years (to the day) after the center's last renaming. "Two icons of aerospace engineering and excellence will share the spotlight on Saturday," said NASA Administrator Charles Bolden in a statement to employees on Friday. "I cannot think of a more appropriate way to honor these two leaders who broadened our understanding of aeronautics and space exploration." Armstrong, who died in 2012, became the first person to set foot on another world during the Apollo 11 mission on July 20, 1969. Armstrong, who three years earlier led the Gemini 8 flight, famously said, "That's one small step for (a) man, one giant leap for mankind," as he stepped onto the lunar surface. Dryden was one of America's most prominent aeronautical engineers and was NASA's deputy administrator when he died in 1965. The former director of the National Advisory Committee for Aeronautics (NACA), NASA's predecessor, Dryden helped shape the policy that led to development of the nation's high-speed research program and its record-setting X-15 rocket plane. Neil Armstrong, prior to his becoming an astronaut, served as a research pilot flying the X-15 out of the center that now bears his name. Armstrong was also a part of the center's team that developed the Lunar Landing Research Vehicle, which helped create the craft that later he and other Apollo astronauts used to practice landing on the moon. "Dryden and Armstrong are pioneers whose contributions to NASA and our nation still resonate today," Bolden said. "The March 1 renaming is a fitting tribute that honors their legacies." Congress initiated its efforts to rename the center and test range in 2007. The bill was ultimately approved in both the U.S. House of Representatives and U.S. Senate on Jan. 8 of this year. Obama signed the act into law on Jan. 16. For its part, NASA began transitioning to the new name by first updating its digital assets. The center's website was retitled "Armstrong Flight Research Center" and on Twitter @NASADryden was updated to @NASAArmstrong. Neil Armstrong, seen here in an original painting by artist Robert McCall depicting the astronaut's early NASA career when he was a research pilot at the flight center that will now bear his name. Physical updates to the center's signs and other identifiers is expected to take several months. The legislation did not include funding to facilitate the needed changes. A formal public ceremony to mark the redesignation of the center and its test range is planned for this spring. In its almost 70-year history, the flight research center has been known by no less than 10 different names. Originally called the Muroc Flight Test Unit under NACA, the center was referred to as the High Speed Flight Research Station and High Speed Flight Station before becoming part of the nation's space program. On March 26, 1976, NASA's Flight Research Center was named in honor of Dryden, but, due to budget cuts, it was consolidated with another of the space agency's California research centers, becoming Ames-Dryden Flight Research Facility in 1981. It wasn't until March 1, 1994, that Dryden regained its independence and with it, its name of the past two decades. The Armstrong Flight Research Center is NASA's second center to be renamed for an astronaut. In 1999, the Lewis Research Center in Cleveland, Ohio, was redesignated for John Glenn, the first American to orbit the Earth. Click through to collectSPACE.com to watch a video about Neil Armstrong’s years serving at the flight research center that now bears his name. Follow collectSPACE.com on Facebook and on Twitter at @collectSPACE. Copyright 2014 collectSPACE.com. All rights reserved.